There are a very few actors who made name for themselves with their skills and choices in film Industry. Coming to the youngest bunch of heroes, Vijay Deverakonda is one such actors who got huge name with his choices. His last film Geetha Govindam was a blockbuster with the revenue it got and he is now coming with NOTA under the direction of Anand Shankar of “Irumugan” fame and is produced by Studio Green Productions of Gnanavel Raja. This movie marks the debut of Vijay Deverakonda into Tamil industry. Buzz is high with the promotions and this movie is a litmus test for the credibility ang crowd pulling power of this actor. Lets see how it fared. Varun (Vijay Deverakonda) is a reckless and arrogant son of Chief minister Vasudev (Nassar). Due to the corruption charges on Vasudev, he decides to make his son Varun as interim CM. Despite being sworn in as CM, Varun continues to be that rich spoilt brat as he don’t like that post and he only wants to enjoy his life. He takes drugs, enjoys with girls and he does everything a guy in his youth do. Vasudev gets convicted and riots start in the state and it leaves state in a worst place. Varun gets hurt and takes responsibility for an incident that disturbed him. He orders Police to take action against them and there aries a situation where father and son become rivals and their game to the power is the rest of the story. Vijay Deverakonda as CM and reckless youth is superb. He nails in his two different shades of his role. Nassar is nice in his role as father and CM who is well versed in the wits and political games. Sathyaraj is fantastic in his role as journalist. Mehreen Pirzaada is okay and Sanjana Natarajan is good. A R Murugadoss surprises in a cameo. Every other actor has given their best efforts to make their roles come alive. The story of NOTA is simple and it looks more of a vague picture of Tamil Nadu politics. Screenplay is written in a okayish way and dialogues are just okay. Songs composed by Sam CS are not so catchy as we expected and they sound more like songs of dubbed movie than a bilingual. The music director has done a terrific job in composing background score which helped the movie in a big way. Shantha Kumar has done tremendous work to shoot some fantastic visuals. He scores well in his department and elevate overall feel of the movie with the visuals. Editing could have been much better by Raymond. Art department has done good work and production values are rich and apt. 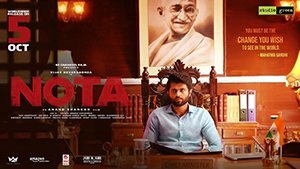 NOTA is a political game between a good guy who want to do good to people and a corrupt leader but within the same family. This feels more like a game of thrones in politicals. A lot of first half is taken to setup the base of story and to introduce characters and towards the end of this half we gets into the actual story. Second half starts with a huge expectations in audience minds and in actual it runs on flat note. This movie has a lot of Tamil nativity and it makes us (Telugu audience) disconnected. 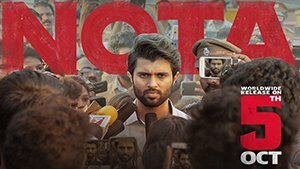 After the blockbuster of Geetha Govindham, Vijay Deverakonda has become big and this NOTA should be the legacy of that power. But due to the content and the pace it becomes a disappointment.